Second up in our list for misjudged golf courses is Long Bay Club. This is a Jack Nicklaus signature golf course, this is one of two in the area. As reported by Myrtle Beach Golf, “it is a thoroughly modern, tough-as-nails but nonetheless fun golf course in its own right and the only real reason that it doesn’t get more love is because it’s slightly off the beaten path, up Highway 9 in Longs.” Myrtle Beach Golf Holiday stated that the “mounding and waste bunkers help define a layout that earned 4.5 stars in Golf Digest’s Best Places to Play guide and have long made it a locals’ favorite.” They even continued to say that “the back nine at Long Bay is particularly strong. The 10th, a short par 4, plays to an elevated green and its fairway is surrounded by a waste bunker, creating a stunning a visual that makes it the course’s most photographed hole. Not to be outdone, No. 13 is an island green par 3 that requires steely nerves and a good golf swing.” After reviewing multiple reviews on Trip Advisor, various golfers commented about how the staff was very friendly and accommodating. They also expressed how great the course was maintained and the condition it was in. If this course peaks your interest and want to book a tee time, call one of our golf specialists or book online at www.myrtlebeachteetimesnow.com. Remember that kids play free with a paying adult! Rounding out our list is Aberdeen Country Club. This course was designed by Tom Jackson. Aberdeen has been given multiple awards like being awarded 4 stars in Golf Digest, and they also named them as a “Place to Play” back in 2006, and recently named “Best of the Beach” among North-end golf courses by The Myrtle Beach Sun News. Aberdeen is home to three different courses. 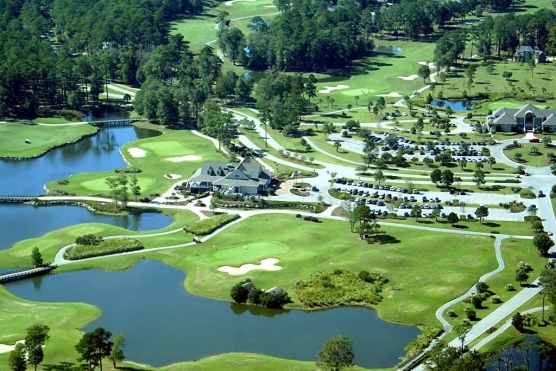 Myrtle Beach Golf at MBN claimed that “Meadows and Woodlands each feature a par-3 No. 8, complete with water, trees and sand in your line of sight. The opener on Highlands is a par 5 that plays just shy of 500 yards from the whites. A slender fairway someone slims even more after the opening shots. If nothing else, it makes the rest of that side seem a bit more open.” Many golfers on Trip Advisor posted about how the course is in good shape. There were a few that said they enjoyed the sand traps, water, and change in the terrain. One golfer stated that “even though it’s out on 9, it’s worth the drive!” It was even pointed out that there was a new Clubhouse and Pro Shop that was recently completed in 2017. If this sounds like a perfect match for you and your buddies you can add Aberdeen to your Myrtle Beach golf package, or book your tee times online at www.myrtlebeachteetimesnow.com. And Just like Long Bay, kids play free with a paying adult. Spring is just around the corner and golf package tee times are filling up fast. Be sure to ask our golf specialists about filling your tee times today!